The Anse Cafard Memorial in Southern Martinique is a deeply moving monument to the losses imposed on African peoples through the slave trade. On a gently sloping field facing the sea, within view of Diamond Rock (Le Rocher du Diamant), Martinican sculptor Laurent Valére has built a tribute to a horrific shipwreck and a most painful history. As midnight approached on the night of April 7, 1830, a ship carrying a cargo of Africans destined for the illicit Caribbean slave market crashed into the rocky shore near the village of Diamant. The slave trade had been abolished and the ship was approaching Martinique clandestinely. Forty six bodies were recovered-all but four of them Africans who were buried in a mass grave near the post where the river meets the sea at Diamant. Tens of others were rescued and sheltered in local households. The colonial government of Martinique, unsure about the legal status of men, women, and children brought forcibly into the island, where they could be neither freemen nor slaves, sent the survivors to Cayenne. 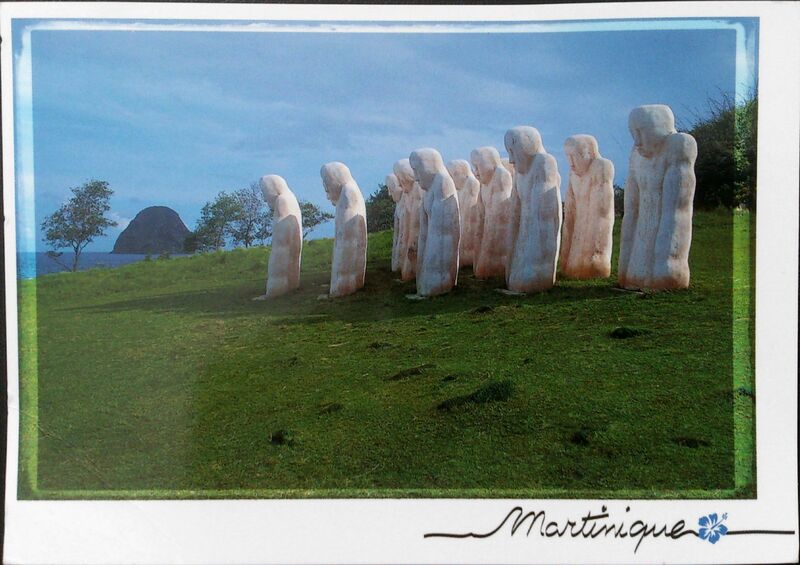 Once there, they disappear from official Martinique history. Unveiled in 1998 to commemorate the 150thanniversary of the emancipation of slaves in the French Caribbean colonies, the memorial is formed by 15 massive 8-feet statues made out of cast concrete and sand arranged in a triangle (an allusion to the triangular trade) turned 110º in the direction of the Gulf of Guinea. They stand stoically facing the sea, shoulders hunched and brows clouded, a monument to pain and loss. This entry was posted in Martinique and tagged Anse Cafard Memorial, Caribbean, Diamond Rock, Gulf of Guinea, Laurent Valére, Martinique. Bookmark the permalink.